I met you guys at Komikon yesterday. Thanks again for signing my two volumes! I saw your comics in bookstores but never got to read one until my sister in law went to the komikon and bought all three.i super enjoyed them.when's the next one coming out (*.*)? Feeling a little bit down today. It hasn't been 24 hours since I bought Book 2&3 in National Bookstore Glorietta 5, and pages 13-25 came off the binding of Book 3. It wasn't torn off at all-it just came off. Now pages 1 -12 are also starting to come out. I have stopped reading book 3 just to avoid having the rest of the book disintegrate. And sad to say I already threw the receipt away. Is there any way I can have this fixed? I think I read somewhere that you've had some reports of the same thing happening. It's just upsetting since I'm done with Books 1&2, but I can't risk reading the rest of Book 3 anymore. wla n po kc sa mga national bookstore, pde b bumii sa mismong visprint? If your local branch of National Booksotre doesn't have copies, just go to their customer service counter and ask them order copies for you. You can order via Visprint, but you'll have to go to their office in Manila to pick it up. Foreword was correct, Volume 3's by far the best volume. Effin rocks. Love the Kambal origin. Hello... I really enjoyed reading the whole Trese series, especially Book 3, and will be looking forward to the completion of Book 4. There's a thing that quite bugs me, though I understand that Book 2 contains "unreported" murders. In Book 2 Case 8, "The Association Dues of Livewell Village", at the end of the case, Bagyon Lektro declared hostility against Trese and warns a foreboding storm to come and the Lightning Tribe won't be of help to them, and Trese mentioned something about strengthening their defense against the Lightning Tribe. Is this "storm" the final battle against the Talagbusaw, where Bagyon Lektro had chosen to side with the Talagbusaw?? Or will we expect some conflicts against the Lightning Tribe in Book 4 or in other future stories?? Bagyon Lektro has been shot on both eyes during the "Act of War", and he seemed to be shut down, either temporarily or permanently. But as the leader of the Lightning Tribe, I think he should not be done for and will return in the future. And another thing, did case #8 happened between the time that Trese asked the Lightning tribe to side with them and the time of the final battle against the Talagbusaw?? Well it could be possible, noting that there's a lot of supernatural cases going on in the metro.. If the above is true, then we may say that the "storm" is actually Bagyon Lektro's choice to side with the Talagbusaw. But if Case #8 happened AFTER the Act of War (Case 13) since Book 3 is more of a flashback, then there's a reason why Trese did not consult Bagyon Lektro and directly deal with Bagyon Kulimlim. And I could say is that Bagyon Lektro has NOT been shut down for good, being shot in both eyes during the Act of War and is really formidable. Bagyon Kulimlim gets found out and Trese takes him down and and shuts down his operations. Bagyon Lektro gets angry at Trese for doing that to his son. Yes, Bagyon Lektro must've known that the Talagbusao was on his way and that's why his said there was a storm coming and that Trese won't get any help from him. When Talagbusao finally attacked, Trese just went to Bagyon Lektro to make sure he wouldn't side with the Talagbusao. Trese wasn't really asking for his help, but she was just making sure he doesn't get in the way. And yes, it would be great to see a new askal/segben pack in action. So, I had to re-read TRESE 3 again, hahahah, and now I rememebr that Trese's main reason to go to Bagyon Lektro was to warn him that Talagbusao might attack his power plants. It is also to Trese's best interest that the city doesn't lose power and electricity and far as she's concerned, Bagyon Lektro didn't violate any of the rules. It was Bagyon Kulimlim who started to demand for sacrifice and that's why Trese shut him down. Thank you very much for the clarification and the thing about Trese's true intention in going to Bagyon Lektro! Well then, I'll be looking forward for more action!! God Bless and more power to Trese!! How come the Kambal never run out of bullets? Kidding. I was wondering what made the Kambal obedient and loyal to Alexandra? I mean, it could not be just because of the masks since Alexandra spent years on the Balete while the Kambal were still kids. When she was finished with the trial, the Kambal were shown as buffed and grown up already and they followed her orders (even without their masks on). What if they get possessed or something and fight Alexandra? Can and how will Alexandra handle the OP Kambal? I totally want to see Alexandra battling against her own bodyguards. That would be epic and dramatic. And I think I'd also want to see Alexandra in action alongside her brothers, especially the Thief. Well I'm just so excited for the next mysteries that Alexandra will solve so I thought I'd share this. Have a good day... and a safe night. We hope to bring back one or two of Trese's brothers next year. Thank you very much for picking up TRESE BOOK 3! Hi! I just recently got hold of Trese # 3 and after 1 read ung cover nya natanggal from the spine. It's not the pages but the cover itself na nadislodge. I've read somewhere na I can have it replaced pero I don't want it to be replaced and have the same thing happen again....Pano nga ule papalitan cya? As of Jan 14, 2016, wala na pong Volume 3 sa National Bookstore SM North. Will try sa Fully Booked. Sana magkaroon ng volume tungkol sa tatay ni Alexandra and how her family became the Pulis Pangkalawakan for the Unexplained. Mukha kasing AWESOME din ang tatay ni Alex. Another question. 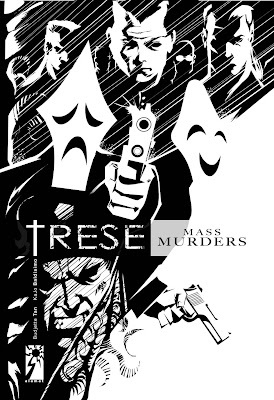 Would you ever consider, kung meron mang mang-alok, having a movie / TV adaptation for Trese? Sino ang magandang gumanap as Alexandra? Sobrang ganda ng kuwento, sir!!!! More pa, please.